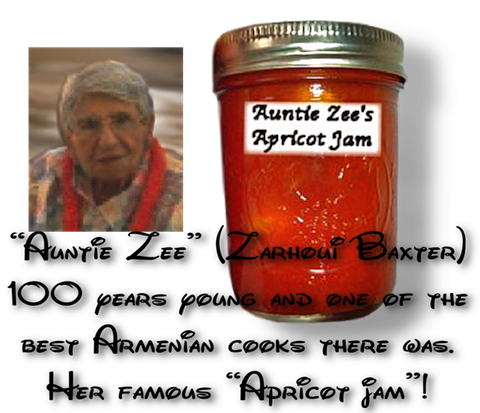 My wonderful spinster Aunt's exclusive recipe for the most delicious apricot jam on earth! This one takes a lot of time and is a labor of love! This lady knew how to cook and always went the extra mile to make things that have her signature! If you find this recipe anywhere else, you can be assured that it was here first. Auntie Zee protected it with all her being, and had a twinkle in her eye when she would (fib) and give it up to those who asked for it. I think I am the only person she ever confided to with this recipe. I think that was because I caught her climbing up a fruit ladder to pick her tree ripened apricots on a hot summer day when she was in her 90's. She knew I was thinking of her and maybe reluctantly shared this recipe to her oldest nephew. 1. Bring all ingredients to a boil and cook until the apricots get soft and just begin to lose their shape. Let cool. 2. Pour into shallow baking pans to about ¾ inch deep. Cover with cheese cloth netting and put in hot sun for 3-4 days to further "sun-cook". 3. When ready, (AFTER 3-4 DAYS) put all the jam back into a large pot and bring to a boil for 10 minutes. 4. Pour into sterilized jars and seal (FOLLOW NORMAL CANNING INSTRUCTIONS). her life and lived over 100 years. If you have any trepidations,  you may skip this step.